On Monday morning in Part One of our Summer Trade Analysis series, we examined the statistical differences between three players: former Blackhawks Kris Versteeg and Andrew Ladd, and current Hawks forward Viktor Stalberg. Monday afternoon, in Part Two, we looked at the differences between departed champions John Madden and Colin Fraser versus their replacements, Fernando Pisani and Jake Dowell. Then on Tuesday morning, in Part Three, we looked how well Nick Boynton has replaced Brent Sopel on the Hawks’ blue line this year. However, these weren’t the only additions the Hawks made over the summer. When the Blackhawks sent Versteeg to Toronto, they didn’t only received Stalberg in return. Philippe Paradis and Chris DiDomenico, two prospects, were also added to the Blackhawks organization. Likewise, the Blackhawks made two deals with Atlanta that resulted in more prospects coming to the Hawks. In the deal that sent Sopel, Dustin Byfuglien and Ben Eager to Atlanta, the Hawks received a package of two players (Marty Reasoner and Joey Crabb) that aren’t with the organization any longer, two draft picks, and Jeremy Morin. With the two 2010 draft picks the Hawks received in this deal, they selected forwad Kevin Hayes and defenseman Justin Holl. 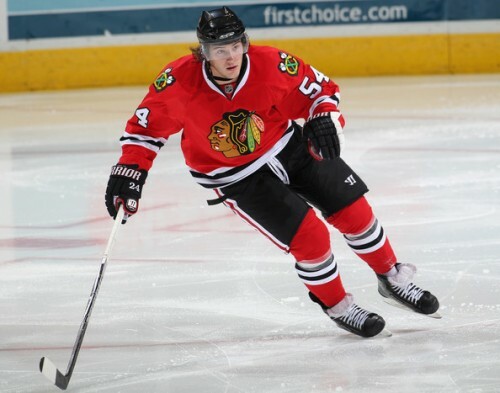 In the deal that sent Ladd to the Thrashers, the Blackhawks received a second round draft pick in 2011 and defenseman Ivan Vishnevskiy. Finally, the Blackhawks received a sixth round draft pick in the deal that sent Colin Fraser to Edmonton. With that selection the Blackhawks added Mirko Hoefflin to the organization. So… how are all of these kids doing? Here’s a brief update on each. Paradis was part of the QMJHL All Star Team for the 2010 Subway Super Series games against Team Russia. He won’t turn 20 until Jan. 2, but Paradis is already listed at 6’2 and 212 pounds and could be playing in Rockford soon if he continues to average over a point per game. 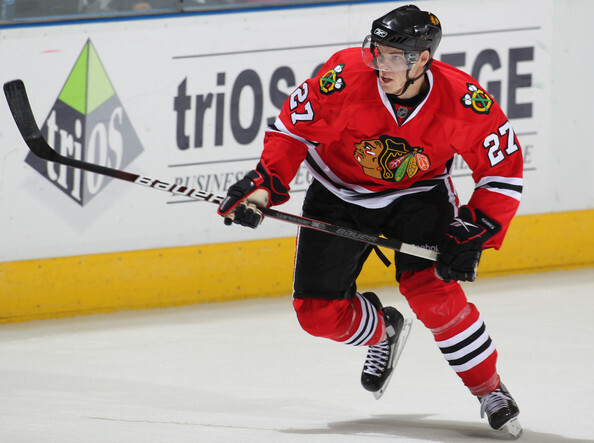 Chris DiDomenico, F – 10 GP, o G, 1 A, 1 Pt, 2 PIM with Rockford of the AHL. DiDomenico is still coming back from a nasty injury that cost him most of last year. Jeremy Morin, F – 11 GP, 4 G, 1 A, 5 Pts, 21 PIM with Rockford of the AHL. 2 GP with the Blackhawks. 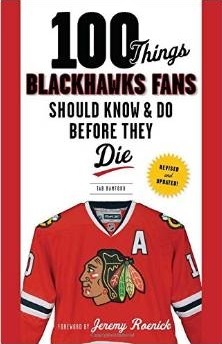 If you haven’t heard of Morin yet, you haven’t been paying attention to the Blackhawks. The 19-year-old almost made the team out of training camp and got a taste of the big time already this year. He’s been hurt on a couple occasions already this year, but he clearly isn’t far away from being in Chicago permanently. Kevin Hayes, F – 8 GP, 1 G, 3 A, 4 Pts, 2 PIM for Boston College. Hayes is a freshman, playing with his older brother Jimmy at BC. Because the Hawks also acquired big brother, we’ll provide you with his stats as well. Listed at 6’3 and 205 pounds at just 18 years old, Kevin is a big, strong kid that will get plenty of time to develop at BC. Jimmy Hayes, F – 10 GP, 5 G, 1 A, 6 Pts, 9 PIM for Boston College. Playing his third season with BC and already the owner of one NCAA championship ring, Jimmy is a big power forward who was acquired on the second day of the NHL Draft in a separate deal that involved one of the Blackhawks second round draft choices this year. Listed at 6’5 and 210 pounds, Hayes could be on his way to Rockford soon. Justin Holl, D – 4 GP, 1 G, 0 A, 1 Pt, 4 PIM for the University of Minnesota. Holl is still only 18 and, because of the Hawks organizational depth on the blue line, will get plenty of time to develop as a Gopher. Ivan Vishnevskiy, D – 14 GP, 1 G, 6 A, 7 pts, 10 PIM for Rockford of the AHL. Vishnevskiy has been a solid contributor for Rockford who could get a longer look at the NHL level in the not-too-distant future. He was brought in as a puck-moving defenseman in the Ladd trade but the strong performance of Nick Leddy at the prospect camp in July led to Bowman making the youngster an offer and him jumping all the way from one year of college hockey to the NHL to begin the season. Vishnevskiy is still a strong prospect who can score. Hoefflin, 18, is a tall, slender center who has a good eye for the net. He’s a few years away, but the Hawks can afford to give him time to develop because of organizational depth at center. Stan: Thanks for making the best of the situation I handed you. Tab: Excellent 4-part analysis on Stan’s moves – hopefully, your stats gain more publicity and appease the media/bandwagon fans who seem to be missing the big picture.